City. 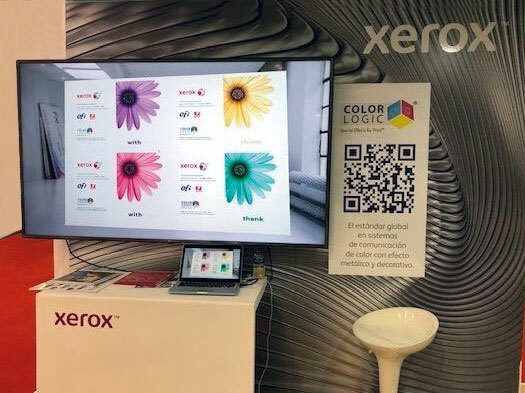 Discussing the successful Expo Grafica event, Color-Logic Director of Sales and Marketing Mark Geeves said: "This was the first showing of Color-Logic at a major show in Mexico, and the software was received with acclaim. The combination of the Xerox Iridesse press, Xerox silver and white dry inks on metallic substrates, and Color-Logic design tools showed the audience the many new applications now available in the Mexican market. The Xerox Iridesse press and Color-Logic design tools, together create product differentiation, higher margins, significant savings of time and materials, and dramatically reduced time-to-market. " Geeves continued: "At Color-Logic, we recognize that All Print Starts With Design. The Xerox Iridesse press opens up exciting new markets for Color-Logic, and we expect Xerox Mexico to be a great partner in educating and demonstrating how to bring value-added print to the Mexican market." West Chester, Ohio, USA; February 2019—Color-Logic has named UBEO its first certified dealer in Texas. Discussing the dealer certification, Color-Logic Director of Sales and Marketing Mark Geeves said: "UBEO is a market leader in the printing equipment space, providing business technology integration across Texas and having recently expanded nationally. A dealer for both Xerox and Ricoh, UBEO recently added Color-Logic to its product portfolio. The design embellishments and time-saving software procedures provided by Color-Logic will assist UBEO particularly well in sales of the Xerox Iridesse and Ricoh Pro C7200X. With Color-Logic, UBEO customer will instantly realize more net revenue and higher margins." Geeves continued: "UBEO has installed Color-Logic in their Austin, Houston, and San Antonio locations, enabling UBEO sales and marketing personnel demonstrate what is available using the platforms provided by UBEO to the market requiring metallic colors and embellishments. UBEO has automated the Color-Logic workflow with their digital presses and their EFI Fiery RIPs, and thus are able to show how Color-Logic design tools reduce the time required to create decorative effects and eliminate the trial-and-error designers must otherwise use." Jay Major, UBEO Director of Production Print, also commenting on the Color-Logic relationship, said: "UBEO is a premier provider offering true Business Technology Integration. We constantly seek the newest, best, and most innovative hardware and software solutions for our customers. Color-Logic is exactly the type of partnership we look for to bring the highest level of value to UBEO customers. The innovative Color-Logic solutions will allow our customers to fully utilize all the capabilities of their production devices by streamlining workflows and minimizing preproduction hours." West Chester, Ohio, USA; February 2019—Color-Logic has named AxiDoc the first certified dealer for Color-Logic in France. Discussing the dealer certification, Color-Logic Director of Sales and Marketing Mark Geeves said: "AxiDoc is a dealer in Southern France for Xerox digital presses and Epson inkjet engines--both of which are compatible with the Color-Logic Process Metallic Color System. AxiDoc has a highly respected sales and marketing team, and actively promotes the manufacturers they represent. AxiDoc also provides clients with access to skilled application specialists who can fully demonstrate Color-Logic tools with Adobe CC/CS and who are certified in working with the EFI Fiery RIPs. " Color-Logic Chief Technology Officer Richard Ainge also commented on the certification: "We have received AxiDoc Color-Logic test form certification files printed on the Xerox Iridesse with Xerox silver dry ink and CMYK and Xerox white dry ink and CMYK inks on Kernow metallic stock. All AxiDoc test forms demonstrated the Color-Logic decorative effects correctlyprinted. AxiDoc has also successfully produced Color-Logic test form files printed using the Epson inkjet engines." 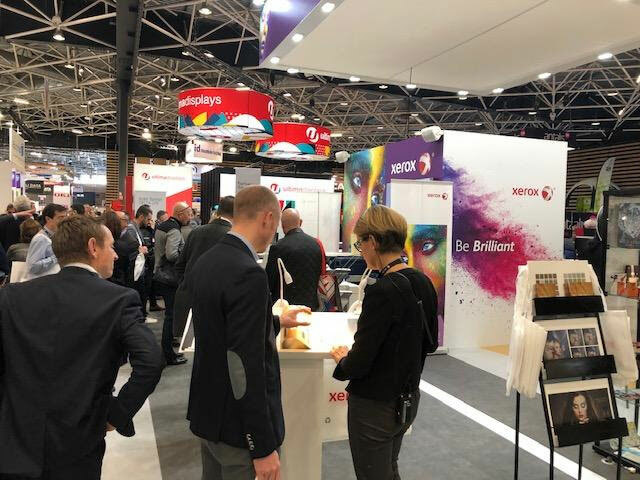 West Chester, Ohio, USA; February 2019—The Xerox stand at the C!Print show in Lyon, France, was an outstanding venue for Color-Logic and Color-Logic dealer AxiDoc. 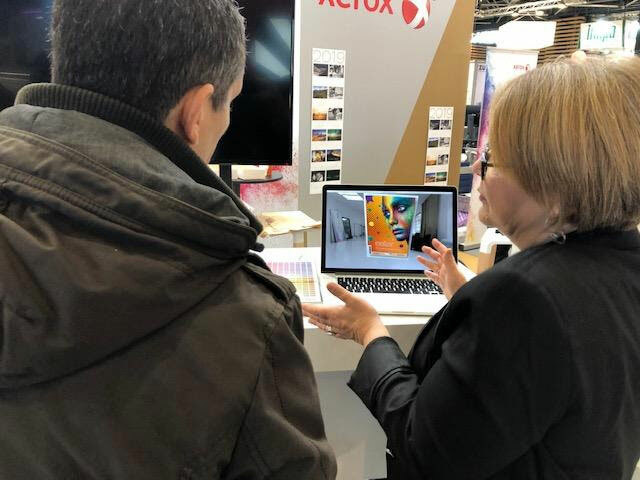 Discussing the show, Color-Logic Director of Sales and Marketing Mark Geeves said: "Until the 2019 C!Print show, Color-Logic had never been demonstrated at a French exposition, and feedback from visitors to the Xerox stand was amazing. The Color-Logic dealer in France, AxiDoc, was busy the entire show distributing printed samples produced on the Xerox Iridesse press using silver and white dry toners." "Color-Logic takes the mystery out of working with metallics." states Christophe Khayat, AxiDoc Directeur Commercial - Impression de Production. "Our specialist Valerie Belain was busy the entire show educating customers and demonstrating how accurately and quickly designers and prepress personnel can take full advantage of the Xerox Iridesse platform offered by AxiDoc. Samples from the Irridesse speak for themselves, but actually showing clients how the Color-Logic special effects were produced really made the Xerox stand a 'must-see destination' for show attendees."